The southwest region of Florida falls in USDA zone 10, the warmest and most southern of the hardiness zones. The semi-tropical climate in southwest Florida remains above freezing all year and can support a number of tropical fruit trees that are difficult to grow in most other areas of the United States. Several types of citrus grow well in southwestern Florida. In, fact much of the commercial citrus crop is grown in that region. Fruits, including a variety of oranges, lemons, grapefruit, tangerines and limes, all thrive in the warm climate. Many types of citrus do not mature until late winter and early spring, when cold weather in other areas would damage the fruit. Among the most popular of fruits in tropical areas, mango fruit is oblong and somewhat kidney-shaped with a thin rind and bright orange flesh that has a distinctive, slightly resinous flavor. 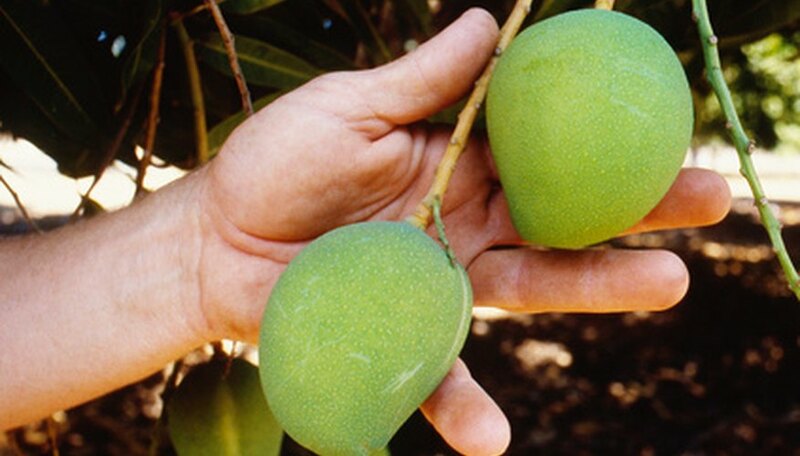 Sensitive to cold damage, mangoes do not grow well above the frost line. In southwest Florida, the trees can grow quite large, bearing many fruits. While not strictly a tree, the papaya plant it tall and upright with an umbrella of large leaves that is tree-like in form. The fruit is large, oval and light green to yellow, forming along the trunk of the plant. The flesh is pinkish-orange, juicy and sweet, with a melon-like flavor. Small black seeds fill the center of the fruit, which can weigh several pounds. Guava is another fruit tree that does well in the region. Available as either the strawberry guava or the tropical guava, each has a different taste. Guava bears egg-shaped fruit that can be red or yellow, depending on the variety. Strawberry guava is smaller than tropical guava and is often used as an ornamental. Cherimoya is a little-known tropical fruit that can also be grown in southwest Florida. The trees are evergreen and can reach around 40 feet tall when mature. Their fruit is large and green with overlapping scales. The flesh is creamy white, sometimes tinged with pink, and tastes like a cross between pineapple, banana and papaya with a custard-like texture. This fruit tree is another lesser-known type that grows well in the area. The sapote is a large tree with hand-shaped leaves that bears many oval, yellow fruits, each about 3 to 4 inches long. The taste is described as a mix of banana and peach. Sapote trees are prolific and can produce much more fruit than a single family can eat. One of the most widely recognized of tropical fruits, the avocado is popular sliced fresh or in dishes such as guacamole. Trees can grow to 60 feet tall, are relatively easy to grow and produce large amounts of fruit. The fruit itself can have either a smooth or bumpy skin, depending on the variety, and soft, buttery, yellow-green flesh. Avocado fruits will not ripen until picked and can be left on the tree until needed.